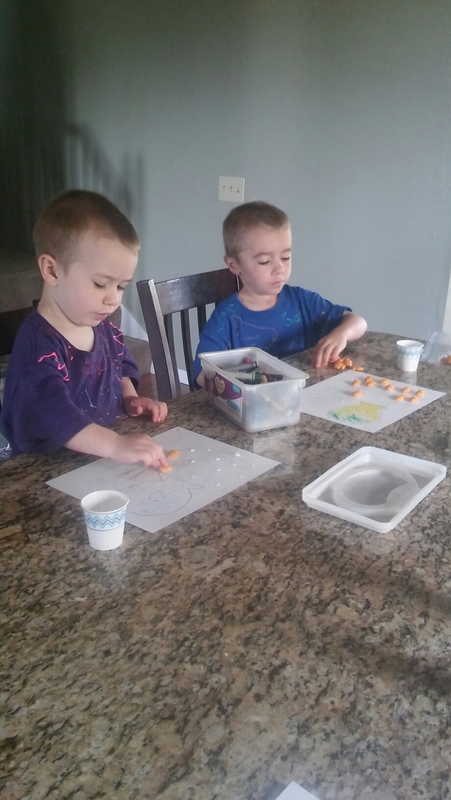 Being a home schooled family can be very challenging at times but it comes with benefits as well. In public school settings the majority of students’ time is spent at a desk in a classroom. For our home schooled family that simply is not the case. We enjoy taking education outdoors! 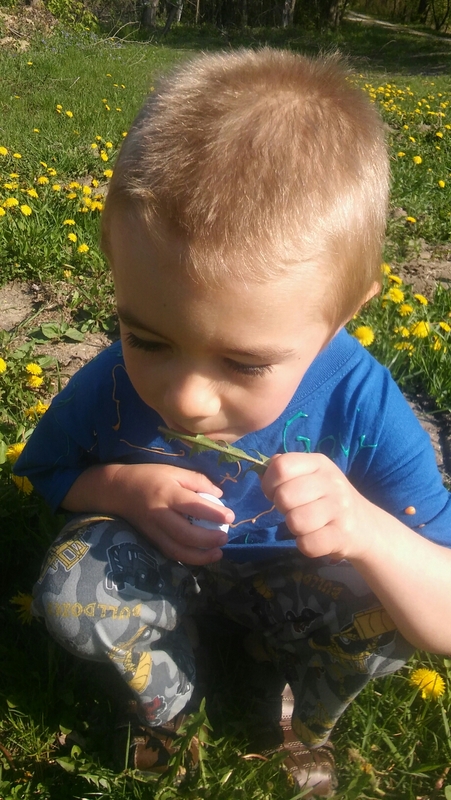 Here on our homestead education regularly meets the outdoors. In fact it is almost on a daily basis. One of our favorite lessons is charting the weather on a daily. This is by far my favorite way to teach and also Tractor Man’s favorite way to learn. He is a hands on kid. 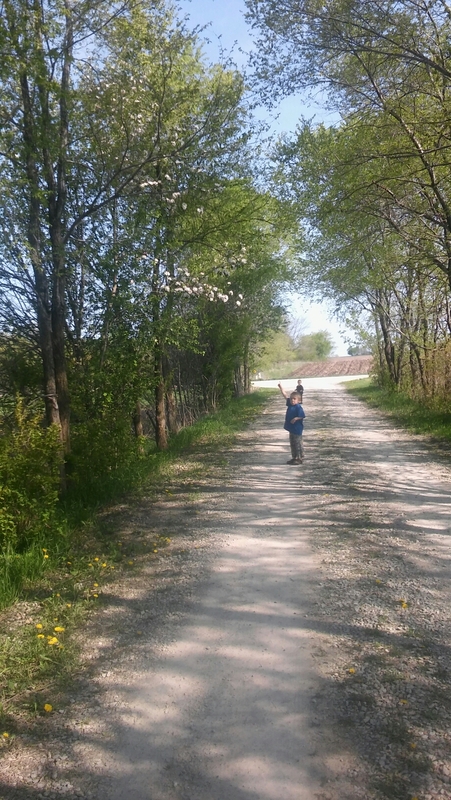 Tractor Man pointing out blossoms on a tree. So what wonderful things can you teach your children in the great outdoors? Really the possibilities are endless. Here are just a few things that I can think of off of the top of my head. Physical education, plant science, plant growth, animal behavior, tree species, weather patterns, animal life, domestic vs. wild animals, types of root systems, survival skills, animal calls, animal habitats, ecosystems, and the list can go on and on. Feel free to let your mind wander and become creative with your surroundings. Right now Tractor Man is just five years old so our outdoor sessions are not too in depth. He can do some basic physical education-this is fun after all because he is five. Teaching him some skills such as climbing, jumping jacks, correct push-ups, and wrestling warm ups are all some of his favorite things. He is slowly adding those into his daily life. Today outside we discussed edible plants found in the wild. Tractor Man knows of berries and how to tell the basics but not to know which are poisonous. Definitely something we can work on there. 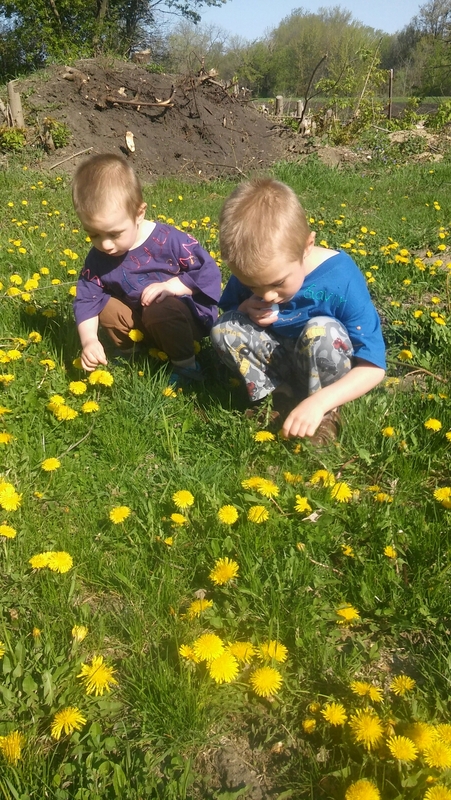 Today we discussed dandelions. This seemed only natural as our yard has suddenly been overtaken by them. By the end of the lesson he even tried eating the greens of the dandelion to see what they were like. He wasn’t completely impressed but he said if he needed food he would eat them. Nettle is growing in abundance around our homestead as well. Being that the property has been vacant for over four years I thought this would be a problem this first spring. I am not brave enough to stew some up but I think I will mention it on our next trip outside as an option. The lesson on plants continued as we planted our seedlings into the garden. Looking at root systems and understanding that not all plants grow at the same rate has been a challenge for him to understand. Tractor Man has also taken on the added responsibility of helping to water the crops. He seems to be becoming quite the little farmer. Educating our children is a top priority for Sir Swine and I but the challenges of home schooling bring us such joy. Although it can be trying on myself and the boys from time to time we do find happiness in being able to explore and learn all around us. We are able to teach them skills that will lead them to be self-sufficient leaders in the future. It gives me a great deal of pride knowing that my children are learning how to stand on their own two feet. As a former public school teacher I know that not all lessons are learned from books. Creating that balance of exploration and education is what we aim for on our homestead. Educating your children in the outdoors opens new areas of exploration for them to become interested in. Studies say girls do not like science, if you put them in the outdoors doing the things they love to do science becomes more interesting. Go with your child. It is an adventure in education you will not want to miss. If you cannot explore the outdoors try bringing a touch of it into your home. We recently did art work on fish and how they travel in schools. 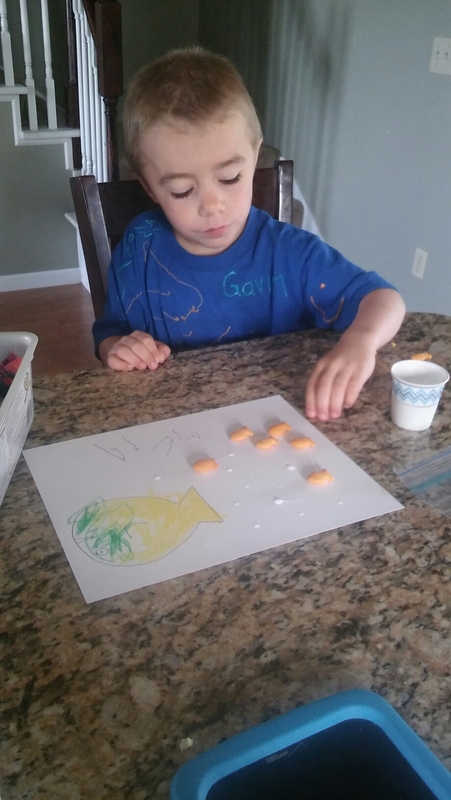 Creating fish schools with goldfish. Happy homeschooling on the homestead.